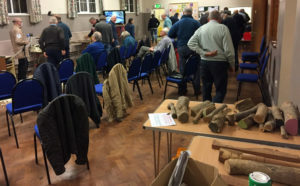 The Cheshire & North Wales Woodturners Association was formed in 1987 in response to the needs of local woodturners, to bring them together in order to share their interest in turning, to exchange ideas, techniques and generally to share in the appreciation of other turners’ work. The Club is always happy to welcome new members of all abilities, and meets at 7pm on the fourth Thursday of the month (except August) at the Memorial Hall, Sychdyn, Nr Mold, Flintshire, UK. The annual Subscription is just £35. A substantial library of Books, Videos & DVDs has been built up over the years for members to borrow. The club has also invested in a colour video camera together with two large TVs, so that members can get an excellent close-up view of the demonstrators in action. The Club generates some much needed income from our attendance at a number of local Shows & Events during the summer months by selling small woodturned items. We urgently require items to replenish our stock of such items and the Club is asking members to make some of these items for the Club. A list of items that sell well together with some tips on how to make them has been put together to help members. Please ask a committee member if you would like a copy of the list.